I would have thought the kitty could do better than this, but I guess those crabby claws are pretty intimidating. ...even if the little crab kind of does look like he's reaching out for a big hug. More funny cat battle, please. Morning, everybody! Last night I introduced you to Pete, the baby birdie who showed up on my back porch and thought my broom was his nest. Here's an update! This morning, Pete was still there, but he'd moved his little feathery self to the bushes and garden area off the porch. He was kind of in a little ball, so I was worried at first that he'd had a rough night. He also had a little bit of straw, like a thread from a palm, kind of wrapped around his little foot, but he seemed OK.
After I took the video, I started to hear a bigger bird chirping around, and Pete started to look up and open his little beak mouth. In hopes that it was Momma Bird coming to get him or feed him, I went back inside and watched quietly from my sliding glass door. And a couple minutes later, Mommy Crow came down and gave Pete a little food in his mouth! (So now we know he's a crow -- a cute crow.) Yay, Pete! All this makes me very happy because now I know his mom is still around and that she'll take care of him. If he's still hanging around for a while, I'll keep up with the Pete updates. He's really cute! 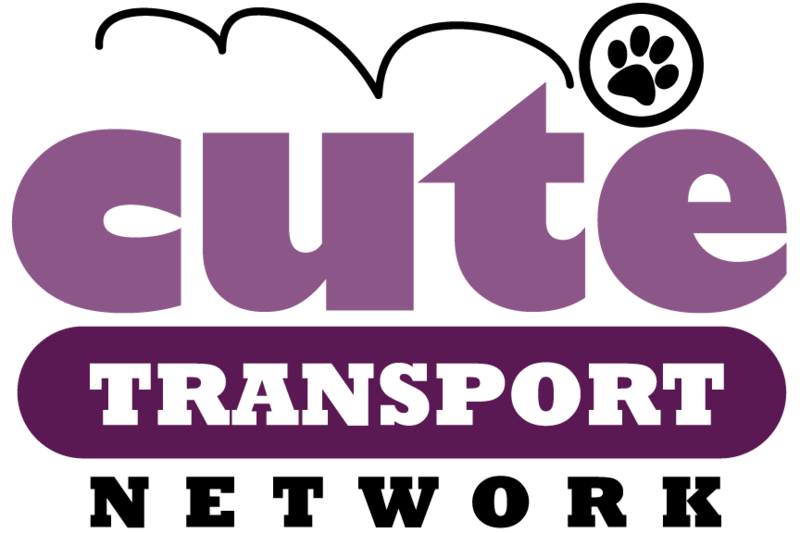 Note from Cute: If you missed the first post where I introduced Pete (and some cute pictures of him! ), click here to read it. Bald is beautiful, right? Well that applies to kitty cats, too. What this pooped little Sphynx cat lacks in hair, she makes up for in cute! Hello Cuteheads! 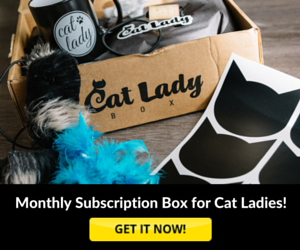 Your Daily Cute is proud to bring you a fabulous contest with our good friends at RomeotheCat.com! Read the details below, and good luck! 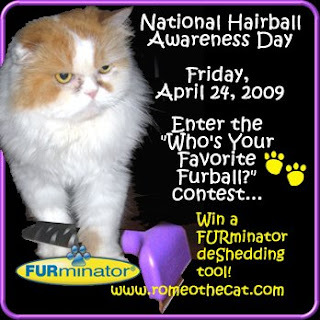 To celebrate, RomeotheCat.com and FURminator, Inc. are sponsoring the Who’s Your Favorite Furball? contest. 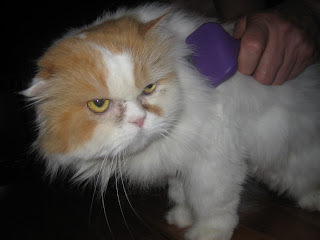 The winner will receive a free FURminator deShedding Tool and will also see their favorite, funniest, furriest furball featured on PeoplePets.com and popular pet blogs across the Internet. 1. Visit www.romeothecat.com and click on the FirstGiving link to donate $1 (or more if you choose!) to Romeo’s FURPOWER beneficiary of the month, Kitten Rescue (www.kittenrescue.org) of Los Angeles. 3. A Favorite Furball gallery will be posted on www.romeothecat.com leading up to the big announcement of the winner. If you have additional questions, please contact romeo (at) romeothecat dot com. This cat really, really wants the feather duster... and he'll go to great lengths and through treacherous territory to get it. He stumbles and falters, but never gives up! Does he get it? My question is: How did whoever was videotaping not help the poor guy?! Meet Jessica the hippo. Sure, she's a hippo, but don't tell her that. She's got free reign of the yard and the house, and even curls up to sleep at night with the dogs -- bundled up in a pink blanket! Q: What do you get when you cross three kitties and one fishbowl? A: A whole lot of cuteness! More cats in fishbowls, please. 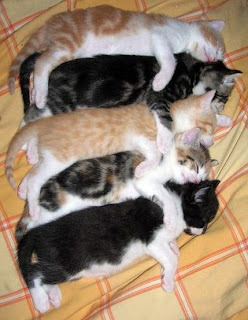 Have you ever seen anything as precious as these spooning kitties? And then we'll throw in a sleepy Spudgie (he's a doggie)!